Does weight lifting help you lose weight, yes it can! muscles burn more calories than fat. If you have never trained before you are more much more likely to be carrying around excess fat on your body than someone who weight trains regularly. Studies have shown a person who has just completed a hard workout in the gym burns 10 more calories per hour after the gym session for a period of 36 hours which can really add up. Think about it, that’s awesome your body is still burning those extra calories hours and hours after you have trained. A total of 360 extra calories burnt, if you add that to the calories you have burnt whilst doing the training session plus your extra cardio you’re be pushing 500 calories for one hard training session. A hard weight training workout or any high-intensity training increases your metabolic rate, in turn, burning more calories post workout, it’s called the EPOC effect. Pete McCall Ms health and fitness expert says “Once a workout is over and you’re back in your daily routine, your body’s metabolism can continue to burn more calories than when at complete rest. Consistency is key! you need to build lean muscle mass first to be able to burn those extra post-workout calories. To achieve lean muscle you will need to be training 3 or 4 times a week hard. The more lean muscle mass you have the more calories you will burn. Matabolism sounds complicated but it’s not its simple. Its the amount of energy our body needs daily to function. It’s basically a biochemical process, calories in food and drinks are combined with oxygen to release the energy our bodies need to function. Just in case you haven’t heard of the term “resistance training” it basically means exactly the same as weight training/Lifting or Strength Training – exercising your muscles using an opposing force i.e dumbbells. 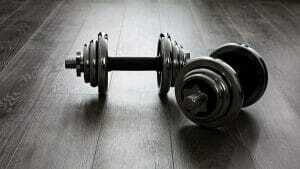 I completely agree always combine the two, aerobic and weights. Try to fit into your busy schedule at least 20 minutes of cardio activity every day, this could even include walking your dog – try to increase the pace a little with each walk – 20 mins on a bike be it indoors or outside. Personally, for my cardio, I use an exercise bike for 20 minutes a day plus dog walks. Always a good idea to see where you are on the BMI chart, if you’re a little too low or too high then set your self some diet and training goals to get back to a normal BMI. BMI is a calculation of a person’s weight in stone or kg’s divided by the square of his/her height in meters. Most of the time the BMI calculations are accurate but less so with children as it does not take into account their growing stages. Studies have also shown that there are inaccuracies for bodybuilders. The BMI calculator will not be able to differentiate between a large body full of muscle or one of fat. Doctors like to use the BMI number to help judge your risk to illness. Please try the BMI calculator below. hey thanks for this article though, i do believe that weight lifting can help you to lose weight, what i found is that intermittent fasting will help lose weight more quickly. Nice article Jay, I think it’s a common misconception that weight training makes you gain instead of lose weight. As you correctly said, it’s quite he opposite. One thing I would at to those trying to lose weight is that you will still gain some muscle so don’t get too shocked if the scales say you’re putting on weight. In most cases this is just muscle replacing fat. Thanks for the calculator, that helped. Good article, informative. Always wondered about that. Cool man, happy to hear the article was of some use to you. That is one of the finest posts I’ve come across in a while. It’s well composed and thought out.